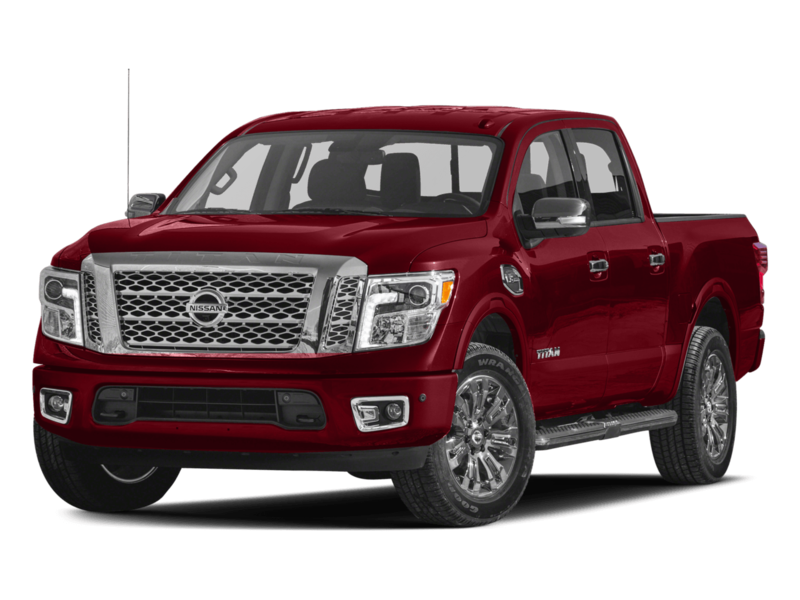 Experience the 2017 Nissan Titan at Sorg Nissan Today! 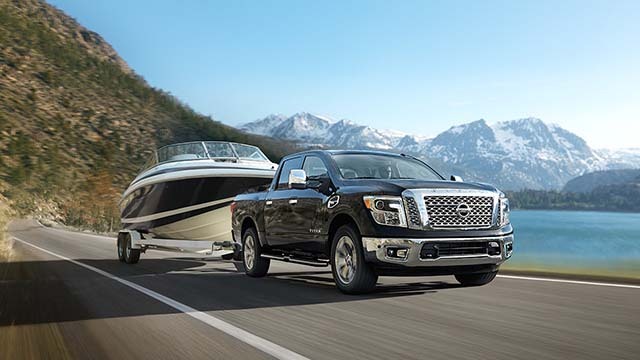 The 2017 Nissan Titan offers truly titanic engine power, providing drivers with mammoth horsepower rates, solid towing capacity, and a range of performance-boosting devices. Yet at the same time it also comes fully equipped with the very latest in smart technologies and reliable safety devices as well. Curious about the details? 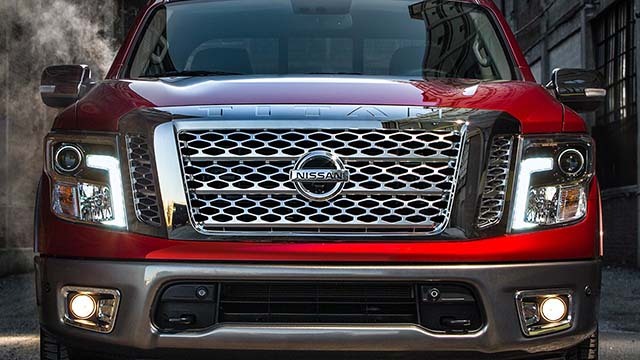 Just read on to learn all about this unbeatable new Nissan truck. First of all, the Titan is unique among trucks when it comes to supplying you with epic amounts of power, with a simply unrivaled engine. Yet this truck also gives you a number of performance-enhancing devices, including Bilstein Off-Road Performance Shocks, a Double-Wishbone Stabilizer, a 7-Speed Automatic Transmission System, Hill Start Assist and Hill Descent Control, and a Switch-Operated 4-Wheel Drive. No matter the trim you choose, the Titan is going to give you simply tremendous horsepower rates with its 5.6L DOHC 32-Valve V8 engine. 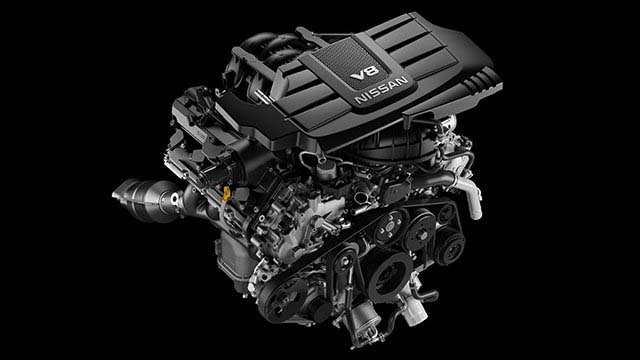 For example, you’re going to be able to look forward to a wild 390 hp, while also getting as much as 394 lb-ft of torque. Meanwhile, the truck boasts simply unbeatable towing capacity, promising an almost incomprehensible 9,390 pounds and giving you a maximum payload of 1,610 pounds. Next, though, the Titan also keeps the drive as comfortable and smooth as possible, with a set of Bilstein Off-Road Performance Shocks. So outfitted, the Titan promises to keep the drive as free of bumps and jostles as could ever be hoped, even when you and your passengers are off-roading on those backroads. Meanwhile, the Titan’s well-constructed suspension systems augment its performance even more. Let’s take just one of these suspension systems: the Titan gives you a front independent double-wishbone with stabilizer bar as well as a multi-leaf rear suspension with solid axle system, which not only helps guarantee your safety on the highway but also ensures that your drive remains memorably smooth and high-performing, even in challenging weather conditions and difficult terrains. 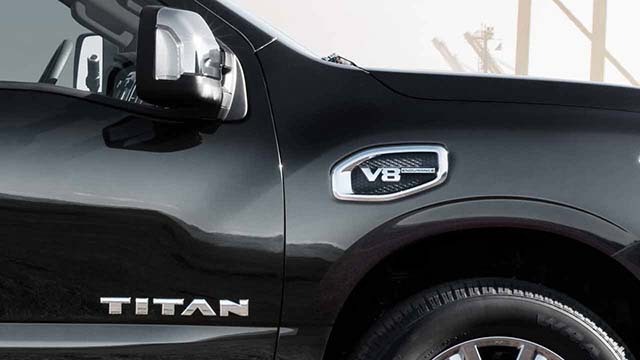 Likewise, the Titan’s 7-Speed automatic transmission system distinguishes this truck from the competition. On the one hand, it helps you save on gas by maximizing fuel efficiency, but it also gives you even greater control over your drive while also making those long drives down-state as simple and enjoyable as possible. 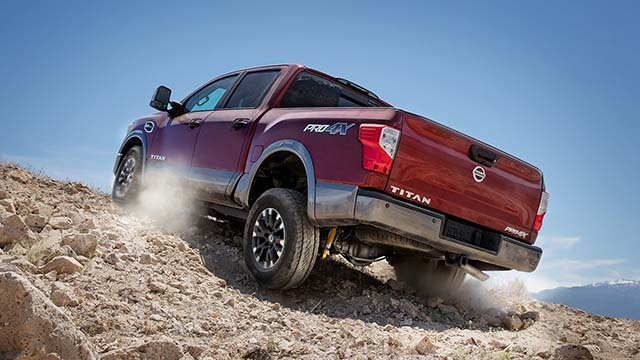 Next time you’re negotiating hilly terrain, you can look forward to awesome performance in the Titan, which comes equipped with both Hill Start Assist and Hill Descent Control. 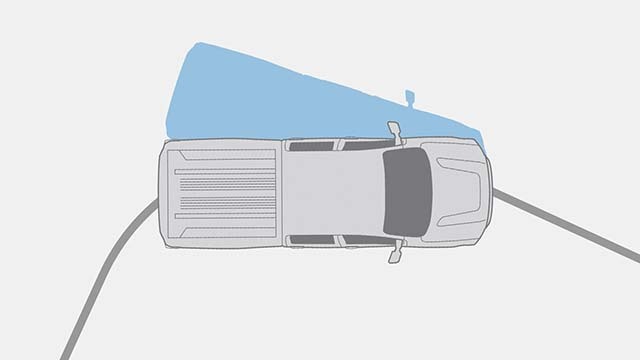 The first locks the brakes up when it senses that you’re starting the engine on a hill, thereby preventing slippage, while the other broadens your control over your speed as you descend, thus increasing your safety. 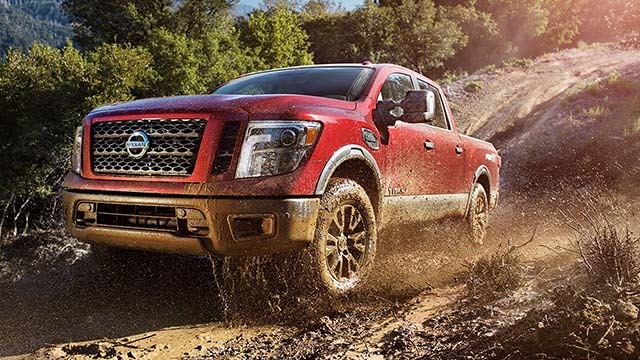 Finally, the Nissan Titan gives you a Switch-Operated 4-Wheel Drive system that allows you to pick the perfect driving mode for whatever conditions you find yourself in. For example, if you’re making your way up a mountain, you can utilize its 4LO mode for extra power, while you can resort to its 4H mode when you’re driving on level terrain. Now let’s turn to this truck’s stellar design. 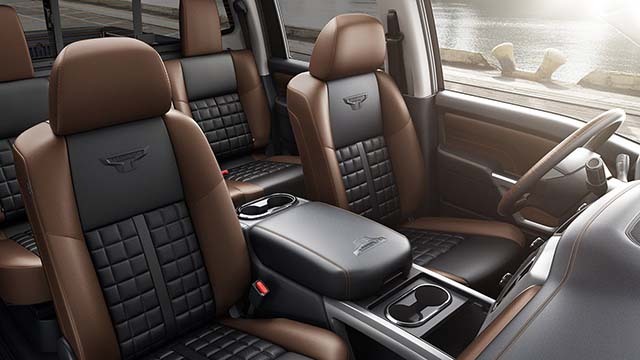 Not only does the Titan give you ample seating and enough flexibility to apportion space based on your needs, but it also comes outfitted with Rear View and Around View Monitors, NissanConnect, and Bluetooth Hands-free Phone System and Streaming Audio. 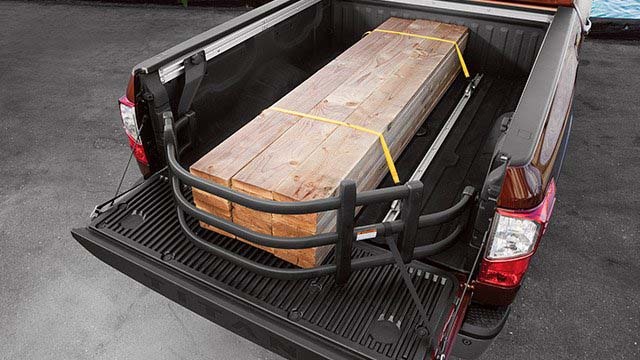 Likewise, the Titan also gives you a spacious and sturdy truck bed to make transporting cargo as simple as can be. Even though it’s a truck, the 2017 Titan provides you and your passengers with a wealth of interior space, giving you seating either for six or for five, and thereby enabling you to fit the entire family into this truck…or the entire work-crew, depending on your destination. Meanwhile, the 2017 Titan also features some of the most comfortably appointed seats around. For instance, top-level trims promise you premium leather appointed seats with Platinum Reserve logos, as well as a heated, leather-wrapped steering wheel with wood-tone inserts. 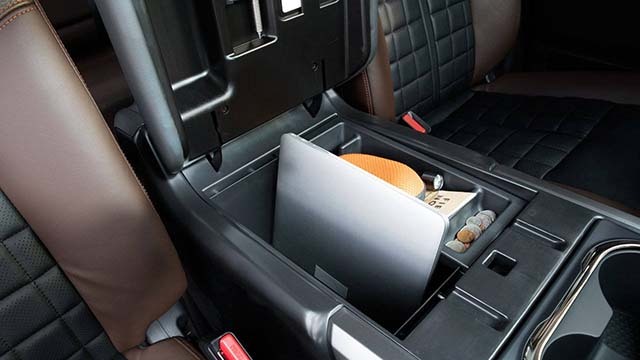 What’s more, the 2017 Nissan Titan’s interior is as versatile as it is comfortable and lavishly appointed. 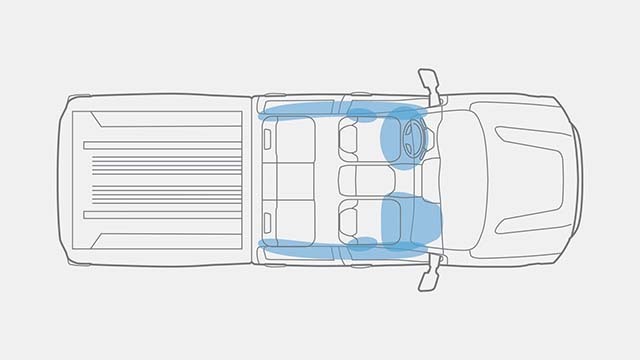 Not only will you be able to count on 40/20/40-split bench front seats, which allow you to flip down the center seats and armrests to create as much space as possible, but you’ll also be able to rely on 60/40 split fold-up rear bench seats to increase the volume inside the truck even more. Whether you’re ferrying passengers from Point A to Point B or transporting cargo or tools, the Titan’s cabin gives you the flexibility to handle all your needs. But we’re still just getting started. For in addition to giving you both ample interior space and impressive interior versatility, the Titan also offers a tremendously large truck bed. No matter the trim, for example, you can look forward to a bed length of 67.0 inches, a bed depth of 20.8 inches, and a maximum bed width of 63.8 inches. Thus, you’re never going to face any problems when it comes to fitting all your gear into this massive truck. At the same time, the Titan makes backing up and operating in tight spaces as simple as pie with a Rear View Monitor and an Around View Monitor. 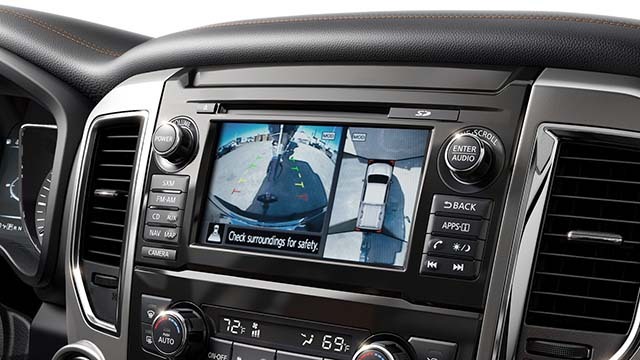 On the one hand, the Around View Monitor utilizes four different cameras to give you a 360-degree view of the area surrounding your truck, thus enabling you to avoid minor collisions when you’re pulling out of a tight parking spot. On the other, Rear View Monitor lets you assess the area behind your truck, allowing you to back up with no problems whatsoever. Never has operating a mammoth truck been so easy. 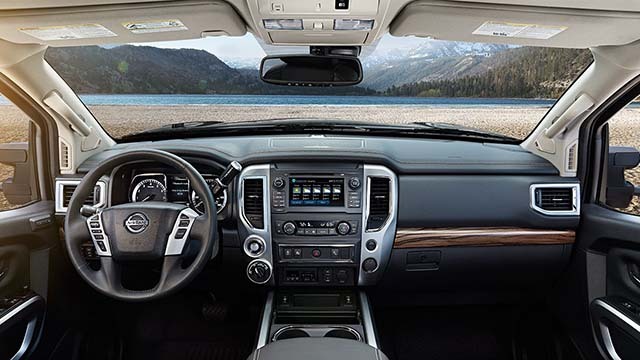 But the Nissan Titan is also an especially enjoyable truck to drive, giving drivers and passengers a NissanConnect system that makes it possible for you to connect your smartphone directly to your Titan truck, thus giving you access to a wide range of your own music, apps, maps, and more. 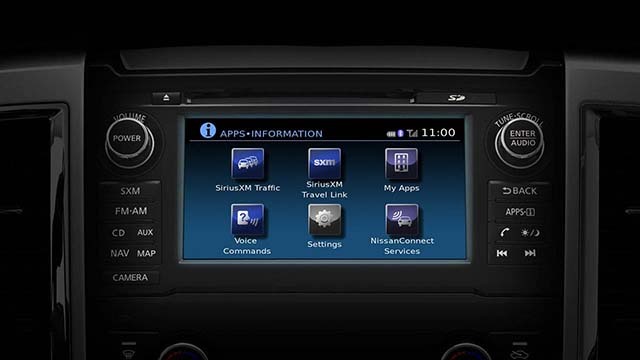 No matter where you are on the drive, NissanConnect will allow you to keep yourself entertained, and when outfitted with Navigation and Mobile Apps, the system will also give you all the latest travel- and traffic-related information as well. Finally, the Titan also gives you a Bluetooth Hands-free Phone System and Streaming Audio. On the one hand, you’ll be able to place calls without ever even taking your hands off of the steering wheel: just use the truck’s Voice-Recognition software to command it to dial up a family member, a friend you’re picking up, and or even a client for whom you’re working. And while en route, you can enjoy even more audio courtesy of the Titan’s streaming internet audio options. Last but not least, the Titan supplements all this power and technological sophistication with a bevy of reliable safety devices as well, including (but certainly not limited to) an Advanced Airbag system, Anti-lock Braking System with Electronic Brake Force Distribution, Vehicle Dynamic Control with Traction Control devices, a LATCH System, Zone Body Construction, and a Tire Pressure Monitoring System. No truck would pass muster with Indiana drivers if it didn’t come equipped with a solid airbag system, and in this regard the Titan is truly distinctive. For example, it gives you single-stage driver and passenger supplemental front air bags with venting technology as well as seat belt sensors. Likewise, it comes with two supplemental airbags as well as roof-mounted curtain side-impact airbags with rollover sensors that can quickly activate the airbags in the unlikely event of a collision. 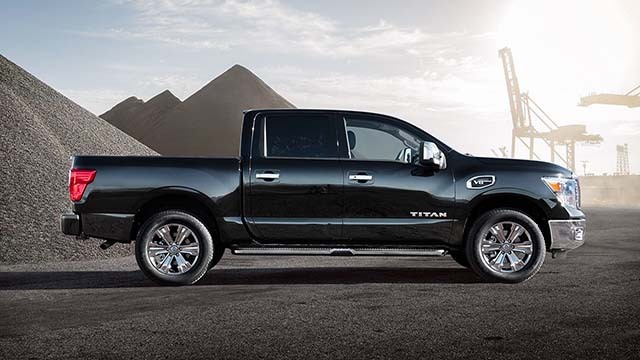 When you need to activate the brakes quickly in order to avoid a collision, the Titan is going to have you covered. Its Anti-lock Braking System is designed to prevent the truck’s huge wheels from locking up, and its Electronic Brake Force Distribution system monitors the Titan’s weight distribution, making adjustments to perfect the balance of its rear braking system throughout the drive. Finally, its Brake Assist device deploys the maximum amount of braking power when it determines that this is necessary, thereby increasing your safety even more. Winter is coming, and that means sometimes treacherous conditions on the highway and around town. Luckily, the Titan comes equipped with both Vehicle Dynamic Control and Traction Control, making it less likely that you’ll lose control of this truck on slippery roads. On the one hand, its Vehicle Dynamic Control can survey the truck’s wheel-spin rates and, after determining your speed, apply the brakes to slow you down, thus allowing you to regain stability. 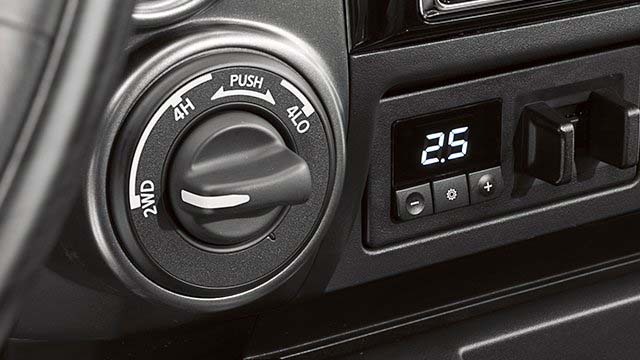 At the same time, the Titan’s Traction Control device compares the truck’s performance to your driving input, mitigating the effects of oversteering and understeering. 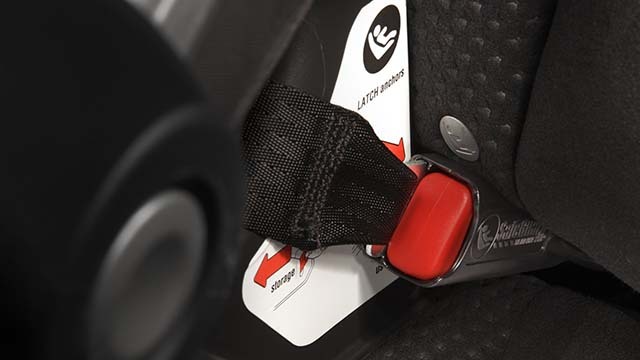 Likewise, this truck is extraordinarily kid-friendly, featuring as it does a LATCH system (Lower Anchors and Tethers for Children), which, with its LATCH-compatible child restraints in the second row, makes it possible for you to ensure that children are safely buckled without even having to use the truck’s seat belts or locking clips. Of course, sometimes collisions are unavoidable. In order to enhance your own and your passengers’ safety in an accident, the Titan features built-in front and rear crumple zone technology. With these crumple zones, the Titan can absorb the impact of a crash and direct its force away from the cabin. At the same time, the Titan also boasts a reinforced steel-frame structure that helps prevent serious injury in cases of collision. In addition to those devices that are designed to prevent injury in the event of a collision, the Titan also includes some devices that allow you to keep tabs on the truck’s vital stats in the simplest ways possible. For example, its Tire Pressure Monitoring makes it possible for to identify the air pressure in your tires without even requiring that you pull the truck over and get out of the cabin. 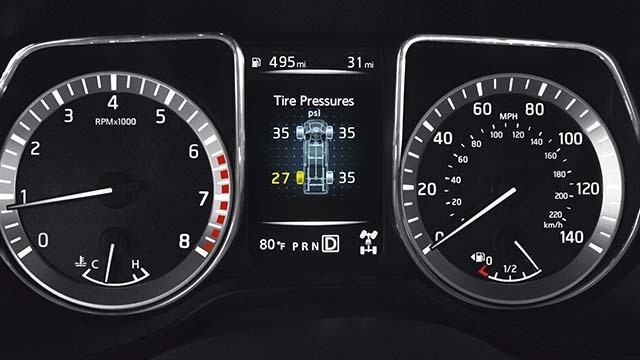 Just glance down at the Monitor whenever you want an instant update on the tires’ air pressure.